What is the Poe Legacy Wall? 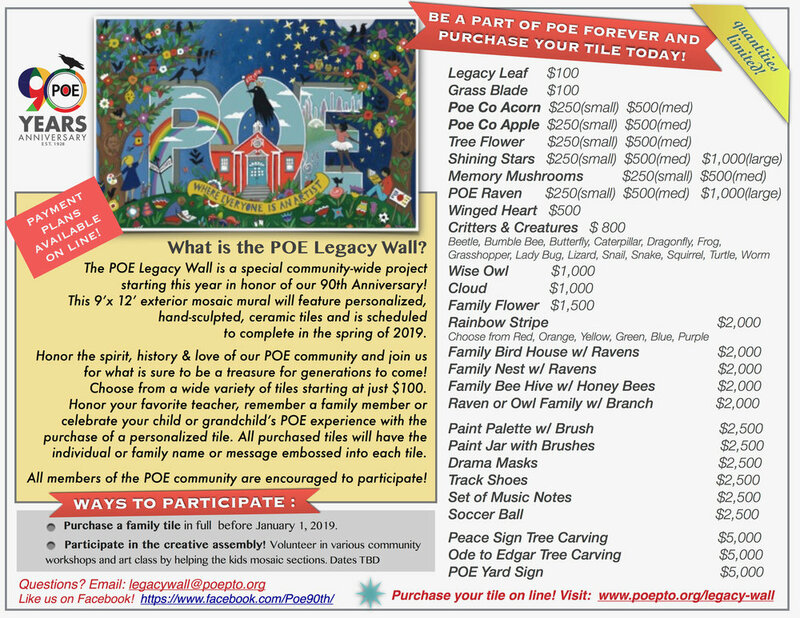 The POE Legacy Wall is a special community-wide project starting this year in honor of our 90th Anniversary! This 9'x12' exterior mosaic mural will feature personalized, hand-sculpted, ceramic tiles and is scheduled to complete in the spring of 2019. Honor the spirit, history & love of our POE community and join us for what is sure to be a treasure for generations to come! Choose from a wide variety of tiles starting at just $100. Honor your favorite teacher, remember a family member or celebrate your child or grandchild's POE experience with the purchase of a personalized tile. All purchased tiles will have the individual or family name or message embossed into each tile. All members of the POE community are encouraged to participate! All purchases are tax deductible. Purchase a family tile before January 2019. Participate in the creative assembly! Volunteer in various community workshops and art class by helping the kids mosaic sections. Dates TBD. Questions? Don't hesitate to ask! Contact us at legacywall@poepto.org. Reserve + purchase your Legacy Wall Tile. You have 2 options: Pay In Full OR Make a Partial Payment. If you choose to make a partial payment, you will pay 30% today, and you will be invoiced for the remaining amount with the ability to make partial payments through December 10, 2018. Please note that prices include a 3% credit card processing fee. Check payments (partial or full) are accepted. If paying partial amount, please pay the 30% down payment cost. You will be invoiced via email for the remainder. Please download the Legacy Tile Order Form, and fill it out with your name, email, phone number, and tile selection with instructions for your tile. Mail checks to Ryan Witz/VP Finance | 2324 North Blvd. | Houston, TX 77098.